Microchip Technology supports legacy lighting communications protocols as well as protocols that are just emerging in the lighting industry. A lighting application that requires a connection with a personal computer can be routed to the Universal Serial Bus (USB) port. Some innovative lighting applications occasionally require such a connection to be established. Several models of PIC16 microcontrollers incorporate a complete USB interface. Several interface examples are offered to simplify the transition from serial port to USB. The Digitally Addressable Lighting Interface (DALI) has emerged as a standard in Europe to address growing power issues, mostly for commercial and industrial purposes. DALI is part of the IEC 60929 specification and relates specifically to digitally controlled dimmable fluorescent ballasts. DALI is mainly for large networked lighting systems. DALI provides bi-directional communications with uniquely addressed light sources. This allows for customized lighting schemes and the ability for the light source to relay output level, color and other information back to the controller. Microchip offers FREE DALI code libraries to simplify development. Microchip's free code libraries and examples for PIC® MCUs help you quickly add a wide array of communication options to any lighting application. The versatility of a Microchip-based solution enables the creation of customized communications gateways and networks that allow for interoperability of multiple protocols. 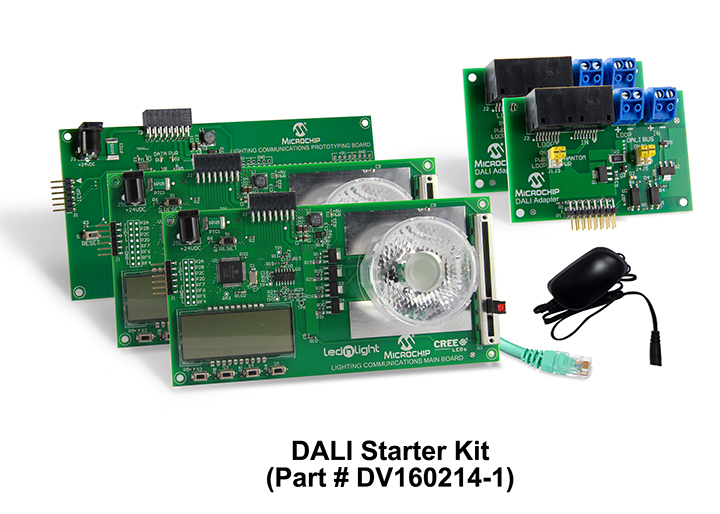 Unlike analog systems, DALI does not require any hardwired power circuit control groups. The combination of individual ballast addressing with digital switching eliminates vertical switch wiring. DALI has a free-form layout (see Figure 1). Daisy chain, star, and multi-drop topologies are all allowed. A combination of two or more topologies is also allowed. The Lighting Communications Development Kit provides a universal lighting development platform for the creation of communications enabled lighting applications. The platform consists of a main board and various communications interface adapters to support in the development of DALI, DMX512A, as well as future protocols. The software in this section is subject to the U.S. Export Administration Regulations and other U.S. law, and may not be exported or re-exported to certain countries or to persons or entities prohibited from receiving U.S. exports (including Denied Parties, entities on the Bureau of Export Administration Entity List, and Specially Designated Nationals).